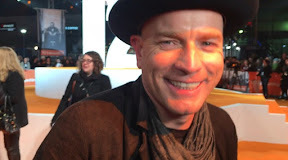 EWAN McGregor said he wouldn't talk US politics at the T2 Trainspotting premiere then cheekily referred to the orange carpet. The star was in a naughty mood as he referred to Donald Trump and said at Edinburgh's Fountain Park: "Let's make the only orange thing we talk about this carpet." He admitted it was great to be back with the old gang and said: "It was nice to shoot this in Edinburgh cause we shot the first one mainly in Glasgow although the first one is set in Leith. I think you'll feel Edinburgh is more of a character than it was in the first one. Admitting that he felt a bit older and wiser this time round than when he first played the character in his twenties he said: "Every day there was a twenty years later moment. It was lovely to read John Hodges words again. He also said he wouldn't have minded wrapping roles with Ewen Bremner for the sequel explaining: "I probably would have swapped with Ewen. He played Renton in the stage play before the movie so probably I'd be Spud and he'd be Renton if we could swap."